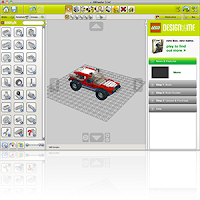 LEGO Digital Designer is quite simply the best virtual building system out there – with its “Click-Stick” method of 3D modeling winning praise from children, parents, teachers and design enthusiasts everywhere. And, as the virtual design platform behind a growing number of LEGO products, LEGO Digital Designer is here to stay. A host of improvements and new features are already in development, including an improved user interface, new connectivity, more life-like building, Technic compatibility and improved train building and animation. So stay tuned – with LEGO Digital Designer, the future is yours.